Stem Cell Therapy, is part of a broader, emerging and exciting area of Medicine called “Regenerative Medicine.” Stem Cell Therapy uses the most potent cells (stem cells) from bone marrow to repair or rebuild injured or degenerated body tissue such as joints, muscles, tendons or ligaments. The bone marrow is rich in stem cells, growth factors and cell signaling substances. Stem cells are drawn in a painless way from the pelvic bone and then is injected, along with your concentrated platelet blood product rich in growth factors (Platelet Rich Plasma) into the painful body part, usually using ultrasound guidance for better visualization. Your Platelet Rich Plasma comes from a simple blood draw, which we spin to separate and extract the platelet rich component. Sometimes we inject fat with this mixture as it can activate injected stem cells and create a healthy environment for them to multiply as well as for providing a cushion. Dr. Pearl has been trained by Dr. Joseph Purita at the National Institute of Regenrative Medicine. Dr. Purita is one of the worlds leading experts on Regenerative Medicine and Stem Cell Therapy. Stem cells are “unspecialized” cells that can develop into another type of cell that is required to repair or replace damaged tissue. They are the body’s “repairmen.” We all have stem cells because our own cells are continually dying and being replaced with new cells. 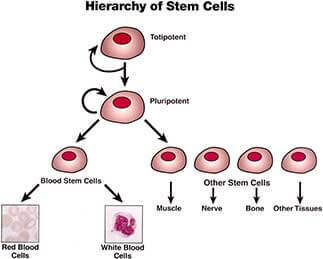 Stem cells are present in bone, fat and blood, but are concentrated mostly in the bone marrow, where blood cells are made. Bone marrow (hematopoietic) stem cells usually develop to form whole blood – red blood cells, white blood cells and platelets. However, in other parts of the body, when exposed to the right growth factors and signaled by neighboring cells, these stem cells can develop into other cells, such as bone, cartilage, tendon and ligaments and therefore, can “regenerate” body tissue. They can also reproduce to make more stem cells for more even healing. So, why does our body not heal itself? Degeneration often occurs in areas of the body where there is a low blood supply and oxygen level, which do not allow the stem cells to reach the painful area or for cell signaling to take place for healing and regeneration. Regenerative medicine provides the right cells, growth factors and cellular environment to promote healing and regrowth in a body area where blood flow and stem cells could otherwise not reach, especially joints, ligaments, tendons and even discs. 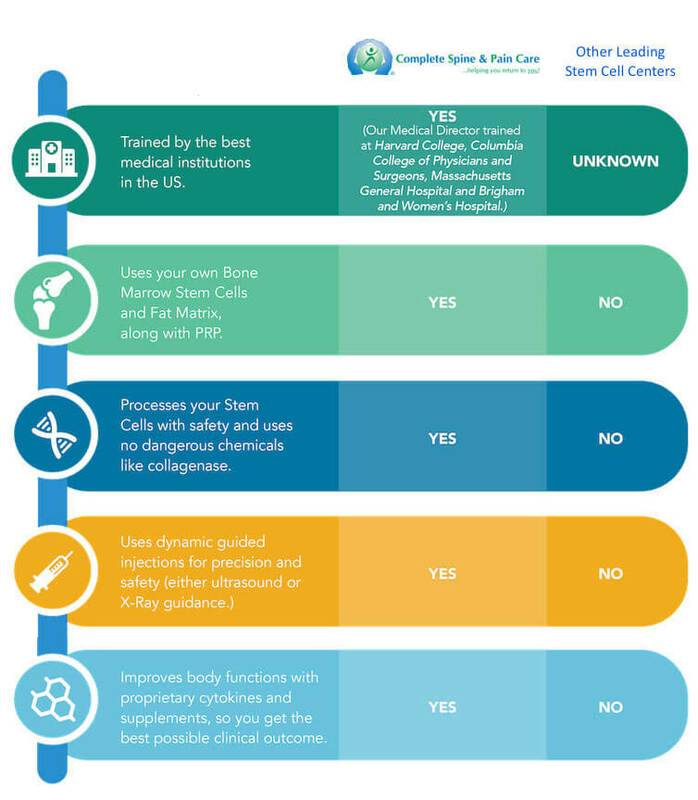 What is the process for Stem Cell Therapy? Although stem cells are naturally present in almost all the tissues in varying degrees, the highest concentration occurs in the bone marrow. Stem cells are gathered by aspirating (removing through suction) bone marrow from the back of a patient’s pelvis. This substance is removed from the patient’s pelvis with a tiny needle. Since the patient is given a local anesthetic, only minimal discomfort results from the procedure. Once introduced, the platelets then release signal proteins and growth factors which activate the stem cells to divide rapidly. Stem cells by themselves are unable to repair the injured area. These cells have to be properly directed, and platelets perform this function. In effect, stem cells are construction workers and the platelets are their supervisors. Once they are activated, these stem cells perform a variety of valuable functions. Apart from repairing damage to the injured areas, they help damaged cells repair themselves and participate in the repairing process. At this point, insurance does not cover this treatment. The treatment is offered only to those willing to pay for it out of pocket. There are many studies showing success of Stem Cell Therapy, including reductions in pain and regrowth of cartilage in arthritic joints and repair of tendons that were chronically damaged. However, the studies so far have not been large enough or at the standard that satisfies health care payers. It is classified as an experimental treatment. Like any medical treatment, there is the possibility that it will not help. Some cases of arthritis are too advanced for even stem cell treatment. We will determine if stem cell therapy might be helpful for you. Although Stem Cell Therapy is considered by some folks to be experimental, various research studies show that regenerative stem cell therapy and platelet rich plasma can provide excellent relief from musculoskeletal pain and ongoing inflammation which occurs in cases of difficult to treat Morton’s neuroma and Plantar Fasciitis. 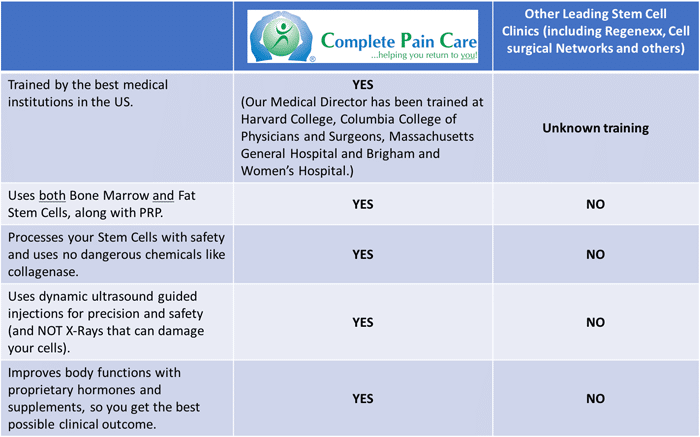 Why choose Complete Pain Care for your stem cell treatment? What types of problems can be treated? How long does Stem Cell Treatment take? While the bone marrow draw only takes a few minures, the total procedure may take up to 2 to 3 hours. Who is not a candidate for Stem Cell Therapy or PRP injections? Patients with active cancers and/or infections. If bone marrow cells are to be utilized and a patient had a history of a bone marrow derived type of cancer (i.e. lymphoma), this would be considered a relative contra-indication. However, many times those patients can utilize PRP injections and fat cells, but the ultimate decision maker should be their oncologist. What should I expect following Stem Cell Therapy? You will be sore and stiff after the injection which will last for a few days after treatment. After the numbness wears off, refrain from any activities that increase your discomfort, and refrain from taking anti-inflammatory medications for at least two weeks after treatment. Control your pain with acetaminophen (Tylenol) or medications that your doctor prescribes. Use ice for up to 20 minutes at a time every two to three hours. Resume any physical therapy regimen about a week after treatment. Your recovery time will depend on the specific condition that is being treated. 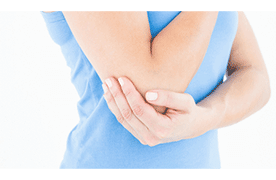 In all cases, the stem cell injections at the site of your injury will need time to grow your new cells. As the regeneration of new cells proceeds, you should notice a gradual improvement in your level of discomfort, and in your range of motion. How much does Stem Cell Therapy Cost? Is it covered by insurance? These procedures are NOT covered by health insurance plans. 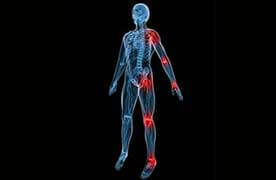 But, with financing, many patients can get their painful joints and back treated for a minimum investment. There are a variety of different financing options available, and we can help you find the best one for you. Each patient’s medical requirement is unique and all our procedures are individualized just for you. Therefore a consultation with our Medical Director (over the phone or face-to-face) is needed to decide your best treatment option and to give you an estimate of the exact cost to you. There may be some pressure at the injection site, but the process is fairly quick. You will be giving a numbing agent to help maintain comfort during your treatment. Most patients say that the marrow draw was tolerable and would do it again. How do I prepare for Stem Cell Therapy? Do not take over-the-counter medications that can thin your blood (aspirin, Motrin, Aleve Advil, Naproxen, etc.). Drink as much water as possible on the day of your injection. Arrange for someone to drive you home after treatment. 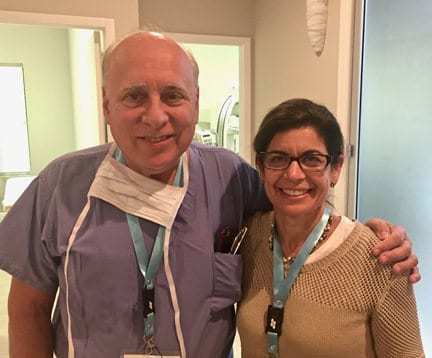 The great majority of patients who responded said that they were satisfied with their treatment and would do it again. More detailed data from early patients is being collected. The great majority of knee patients reported more than 50% relief of symptoms. 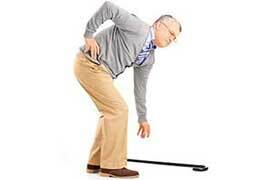 The great majority of hip patients reported more than 50% relief. What else should I know about Stem Cell Therapy? A lot of people are concerned about the reliability and safety of stem cell procedure. Stem cell therapy is safe since your own stem cells are used. This minimizes the risk of problems or complications. Let’s Talk about Stem Cell Treatment for you!